Place orders on an option or an underlying asset. When you hover the cursor over the tab name, a tooltip with the expiration date of the options series will be shown. Select the underlying asset (for example, an equity or a future contract)in the Instruments window . Select the series under the selected asset . Right-click the series to open the context menu. Click the Option desk command . 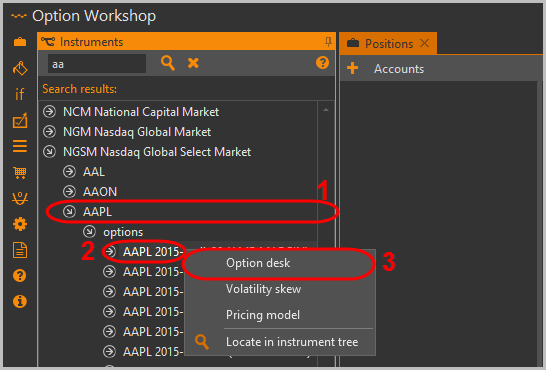 You can have multiple option desks for different option series open at the same time. 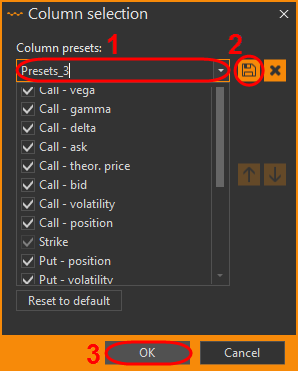 All columns (with the sole exception of the Strike price column) are present in two copies – one is for call options and the other is for put options. 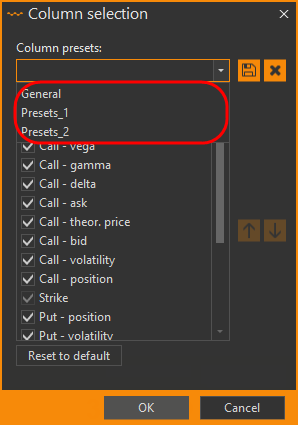 The CALL and PUT options are combined into rows by their strikes. The strike closest to the current price of the underlying asset is highlighted. The current price indicator of the underlying asset. Buttons for selecting the number of strikes.By default 10 strikes are displayed. Select the strikes by clicking on the check box. The dropdown list of the strategy selection. 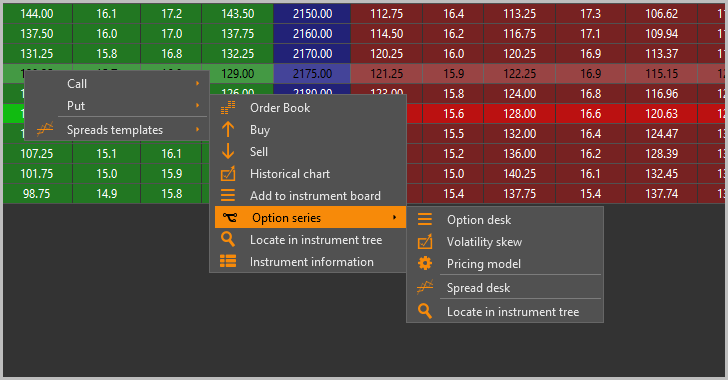 The button opens a list where you need to choose a strategy.If the strategy contains a position on an option that is displayed in the option desk, its quantity will appear in the corresponding Position column. The dropdown list of the column presets. Information about how to create preset is given here. Locate in instrument tree – search for instruments in the General instruments list (see Instruments tree). Right-click on the option to open the context menu. Click the type of option (Call or Put) . Click the desired command from the menu . You may configure which columns will be visible by clicking the button. Use the checkboxes to specify which columns you wish to see on the option desk, then click the OK button to apply changes. Enter the group name in the Column presets field . Click the OK button . The presets will be displayed in the drop-down list. You can also use the and buttons in the Column selection window. To return to the default column order, click the Reset to default button. You can automatically adjust the columns' width to fit the window size by clicking the button. Column settings will be saved and apply automatically in upcoming Option Workshop launches. If you want to return to default settings, click the button.